Perfect for fans of Maeve Binchy, a lovely, warm, Irish family saga of three generations of women coming together one magical summer in the small seaside town of Caracove Bay. Lexi and her husband Sam have put their heart and soul into renovating No. 3 Cashel Square. Lexi's mother thinks it's high time they had a baby, but Lexi's thriving art gallery keeps her more than busy. Plus her headstrong niece Amelie seems to have practically moved in. And then, just as summer arrives, a mysterious stranger knocks on the door. Kathleen Williams has come from America, longing to see the house in Cashel Square where she was born, over sixty years ago. Kathleen's visit is tinged with sadness but she finds comfort and laughter with Lexie and Amelie. The Summer Guest was a delightful and fresh idea influenced by friendship – that of three people in Caracove Bay, in Ireland. Their friendship is a very unusual one that sparks one day in the lovely little town. With Lexi, her marriage has turned from blissful to a nightmare almost overnight. For Kathleen, it’s grief and returning to Caracove Bay to the house she used to live in, even if it’s a plan she made with her late husband. But for Amélie, it’s being a teenager that’s got her life in a mess. If it’s not a boy, it’s her Parents fighting and questioning her at every chance they get. Lexi, Kathleen and Amélie grow a unique and amazing friendship, despite their ages, lives and problems. Having each other there to lean on when they need each other benefits each of them, even if it’s just talking and laughing with each other at the end of the day. 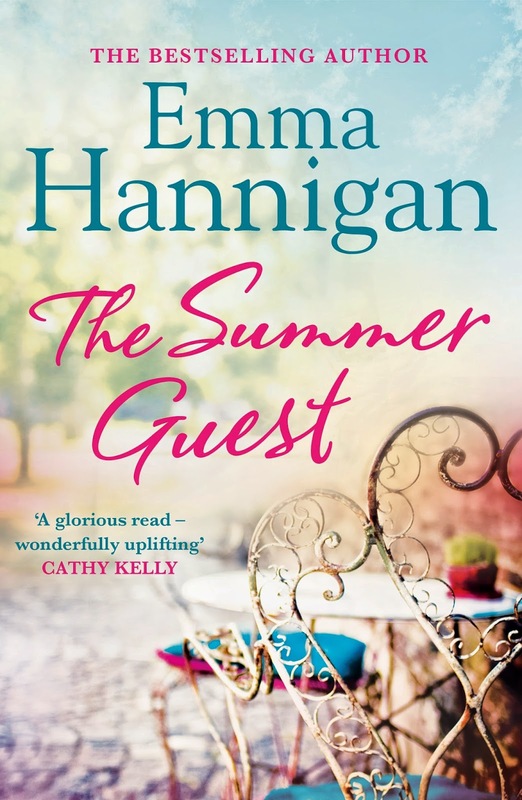 I adored Emma's writing style in The Summer Guest. Women's Fiction has always been my go-to for Adult reads and books like Emma's are the sole reason, with captivating towns and relateable characters and a plot to keep you hooked. Overall, ‘The Summer Guest’ is perfect for adult fiction lovers this summer. It’s the perfect book to read on the beach or on holiday. A must read. Chick-Lit fans everywhere! Anyone who loves Women's Fiction will adore this magical summer story. Oh dear Lord I always cringe when faced with the idea that I should instruct anyone else on how to write a book! You see, I still think I’m a bit of a fraud. I never had any sort of formal training when it comes to penning my books. Writing became my profession quite by chance. At first it was purely my therapy. My way of releasing my hopes dreams fears and anxieties while battling cancer. Swiftly I realised it was exactly what I’ve always wanted to do. So how did I begin? I literally sat one day and began to type. So I guess my first tip has to be just that! 1. Sit and go for it. Nobody else can write your book. Thinking about writing doesn’t raise the word count. So find a quiet and comfortable spot and get writing. 2. Make some planning notes. I don’t mean twelve foolscap pages of intricate details. Just an idea of what you’d like the story to be about. Going back to school English lessons – have a beginning, middle and end. It doesn’t need to be set in stone as the story will always evolve as you go along, but it’s vital to have clear ideas and will ensure the pace is kept going swiftly as you advance through your story. 3. Characters should be realistic. Unless you’re writing about a schizophrenic reclusive psychopath with a twitch who has no grasp on reality, readers need to be able to identify with the characters. Often the ones my readers love most are those that remind them of people they know. 4. Don’t be afraid to let go of your own emotions. By this I mean that it’s fine to laugh like a hyena even if you’re in a room on your own accompanied only by your words. It’s OK to sob like a toddler being left at crèche for the first time too. Odds are, if you find the story hilarious or desperately sad, so too will your readers. 5. If it’s boring cut it out. You are the first gauge on your own work. So if you feel the story or character is boring and you don’t particularly care what happens to them, you can bet nobody else will either. Less is more. 6. Read over what you’ve written. The first draft of a book involves getting all the ideas out of your head. But once you look at it again (perhaps after a few days break so you’re seeing it with a fresh eye) any adjustments can be made. I don’t know a single author who has completed a perfect novel on the first draft! That may sound crazy, but writing is a craft and it won’t work unless you are relaxed and enjoying the process. Magic won’t be made if the author is having to squeeze each sentence onto the page as if it were a chore. As the late great Oscar Wilde famously said: “be yourself, everybody else is already taken.” Finding your own unique voice (and we’re all born with one) is key to knowing who you are as a writer. In my mind, it would be impossible to become a good author without reading other people’s work. In my mind it would be akin to having all the ingredients to bake a cake without the method. Good writing involves learning and what better way than absorbing other authors knowledge? Writing can be difficult as it’s pretty much a solitary occupation. But believing in what you’re doing is a must. If you don’t have dreams how can they ever come true? For me, writing is a gift. I am so privileged to have my work published and I will never take that for granted. With each book I learn so much more than before. I am slowly developing my craft and coming to know who I am as a writer. I embrace the ideas and guidance of my editors and publishing team. I endeavour to make each book better than the last. I hope many more people go down the writing road. I for one would heartily recommend it and already I’m looking forward to reading all your books! 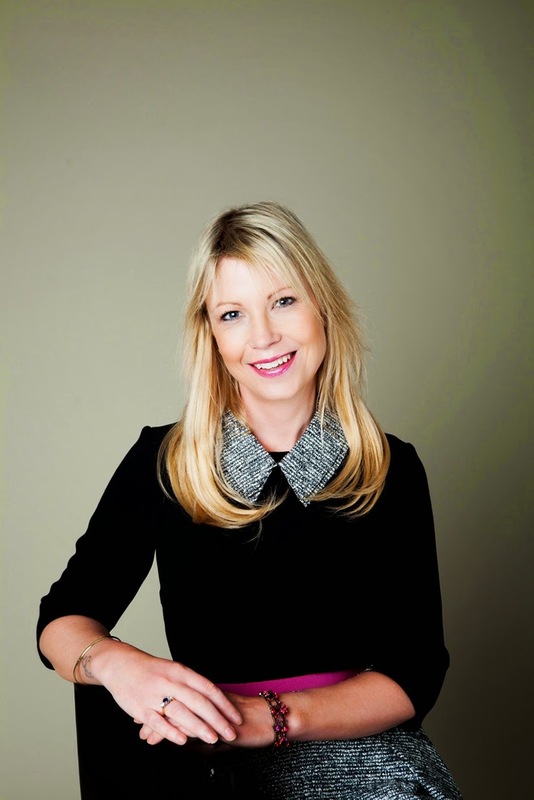 Emma Hannigan is the author of six bestselling novels including Keeping Mum and a bestselling memoir Talk to the Headscarf which charted her journey through cancer. Emma lives in Bray, Ireland, with her husband and two children. 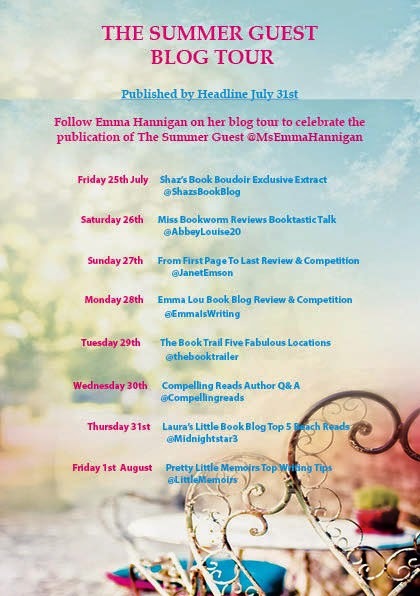 Don't forget to stop by the previous posts for Emma's tour! Have you read The Summer Guest? Nice post. I like the pretty cover and encouraging tips.